Well, hello on a snow day from a warm boat! Some years ago we discovered kerosene heat. I like it a lot. I may well die of carbon monoxide poisoning, but it’ll be with a smile on my kisser, like Sam McGee. We started our boat life with a diesel oven that stank abominably and belched and leered at me. It was an ugly lump of metal, so I whined until John Darling pulled it out, and we froze for the next 10 years until we stumbled across a kerosene heater in Canadian Tire. The first year I sat in front of that heater and inhaled the fumes and enjoyed every single minute! All those years in the Arctic, and I never did get to like being cold. I woke up this morning at 5:00 (don’t ask. It has to do with old age) and when I poked my head out the hatch, there was snow drifting down with silent and deadly intent. Naturally, I was very excited because it meant a day off, so to celebrate I plugged in the coffee pot and planned my activities for the day, which have been extremely basic. I shovelled, I danced to Richard Simmon’s ‘Sweating to the Oldies’, I knit part of a sock, and I baked 50 shortbread cookies. I passed the cookies on to the neighbours, some of whom were also out shovelling. John Darling is resistant to joining in when I sweat to the oldies. “Go Richard!” I yelled. “Sweat it to me baby!” I shrilled. John has a lot to put up with. Tonight I shall re-read Antonia Fraser’s ‘Lives of the Kings and Queens of England’. I shall knit socks. I shall plan next year’s Christmas. I shall bake more shortbread. Sometimes, life is best when you do the least. My toes are curling with happiness. May God bless you this sacred season and always. So begins Catherine’s culinary journey onboard the s/v Inuksuk. 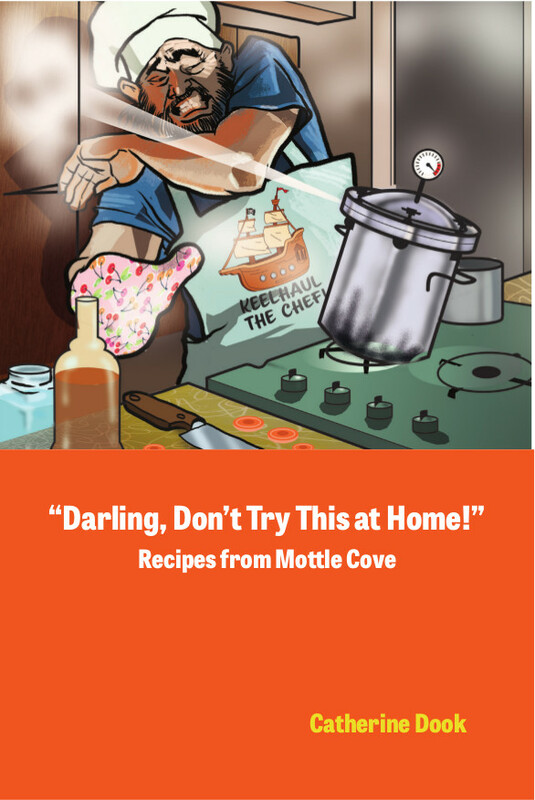 Follow her adventures and musings as, armed with Mrs. Beeton’s Cookery Book, circa 1860, she fights with a diesel oven, experiments with a pressure cooker, finds solace in the comforting arms of a crock pot, learns to light a nautical barbeque and embraces a two-burner hotplate. Only a fool would bake cakes in a crock pot, fry bannock while under way, fight off starlings during a barbeque or try to make vats of blackberry jam with a 1,000 watt burner. Fortunately, Catherine is not hampered by wisdom. Enjoy Catherine’s adventures through the challenges of thinned-out volts and finding enough Sears Catalogues to light fires in the diesel fire pot, and appreciate her happiness when, near the end of the book, she achieves the pinnacle of refrigeration. Will Catherine become a Stepford Wife?